An Israeli company is seeking recognition from the Guinness Book of World Records after claiming to have created the smallest New Testament Bible. The Jerusalem Nano Bible company is claiming to have invented the smallest New Testament Bible in the form of a mini chip that measures only 4.76 millimeters across and can fit on one’s fingernail. The mini Bible reportedly contains all 27 books of the New Testament and requires a microscope to read the text. The Holy Book was invented so it may be carried on a necklace or in one’s pocket. 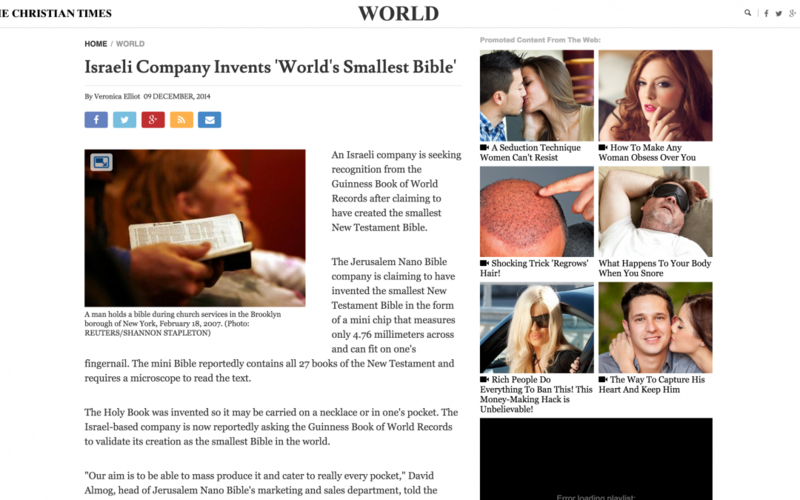 The Israel-based company is now reportedly asking the Guinness Book of World Records to validate its creation as the smallest Bible in the world. “Our aim is to be able to mass produce it and cater to really every pocket,” David Almog, head of Jerusalem Nano Bible’s marketing and sales department, told the Daily Mail. Other entrepreneurs have also sought to create new, unique versions of the Bible to entice interest in readers. Recently, a Kickstarter campaign sought to convert the Bible into a novel format for easy reading. The series would be fit into four sections and be void of the number and chapter descriptions that some readers find to be confusing. Another recent Kickstarter campaign sought to create a Bible that was formed completely out of Emoticons in an attempt to appeal to younger generations of Bible readers.